Hi everyone. A reminder that we are already half way through July. 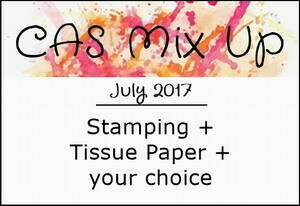 Still just over a week left to play along with CAS Mix Up July's Challenge - Tissue Paper. I created this watercoloured, textured, and heat embossed background while filming my latest video (Tissue Paper Watercolouring & Techniques). I used it to die-cut the flower and frame, placing it over a soft brown script background (second generation stamping). Both the frame and flowers are popped up for added dimension. I've had so much fun playing with tissue paper this month!! Check out the challenge blog reminder post to see more tissue paper cards by our talented Design Team, and Guest Designer, Sue. I know you'll be inspired. Come join us! Total gorgeousness, Loll. Pink and orange is one of my favourite colour combos, and I love the touches of gold embossing and the script background. how pretty Loll - that little touch of gold adds so much! Stunning tissue paper die cut flower and frame, Loll. Love how you added your 2nd generation soft text background. I agree..this months tissue paper challenge has been so fun and creative. TFS my friend. Hugs..
Oh, I love this color combination - yellow, orange, pink and gold! This is a super-pretty tissue paper flower card, Loll! WOW! This is spectacular, Loll! That frame is so perfect for the script! How imaginative. Love the glorious colors of this too. Your photography is fantastic with Alex's backdrop! How beautiful it looks! Wow Loll, this tissue paper is so gorgeous. Love the colors with the gold. Gorgeous background and I love the combo of colors you used for the flowers. WOW! Love these colors and the patterns the ink made! Love how it looks cut with this die! Really amazing technique and stunning colours. Gasp!!! Oh my goodness, Loll...this is absolutely GORGEOUS! Your design is so elegant and I love the softness of the script in the background...truly stunning in every way! Another gorgeous card! These colours together are beautiful...then again, you are so good with colours. The script background is a great touch. Love those new backdrops too. Beautiful card, Loll! I love the gold highlights. The color is gorgeous, Loll, and the gold embossing adds that extra sparkle.